Are you looking for ways to add more revenue streams to your business? Would you like to find out how I increased my revenue by 50% in 2018? 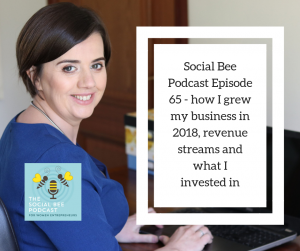 In this episode, I talk about the six income streams that helped me grow my business in 2018. If you are looking for ideas and inspiration to help you push your business forward in 2019, you’ll find out exactly what I invested my money in in 2018 and what opportunities I will pursue in 2019 to ensure my business continues growing. Why investing in your business development is key and how it directly impact the bottom line of your business. What you can do to add more revenue streams to your business in 2019. How unpaid gigs and projects can help you raise your visibility and profile (and lead to exciting opportunities down the line). My membership: The Social Bee Academy. Raise Your Visibility Online Summit, 2018. Join my 30-day social media challenge and receive exclusive access to my monthly value-packed webinars. Atomicon 2019, with Andrew and Pete. Youpreneur Summit 2019, with Chris Ducker. Will you be joining me? It’d be great to see you there! If you enjoyed this episode and want to find out more about how you can work with me, email me at louise@socialbeeni.com.